Stourbridge Lawn Tennis & Squash Club is a members’ club located in an attractive rural setting on the western fringe of the Black Country, 15 miles west of Birmingham. It has 14 tennis and six squash courts and around 1,300 members. Membership has recently been boosted by the addition of a high-quality 25-station gym to its traditional rackets facilities. Each section (tennis, squash and racketball) is still run largely by volunteers, with a full-time bar manager, a club manager and a range of other part-time staff. It has traditionally been one of the prominent squash clubs in the region, consistently competing for Worcestershire and Midland League titles (men’s and women’s). The club is unusual in the way racketball holds equal ‘status’ in numbers and influence alongside tennis and squash. The success of racketball over the last 25 years has enabled the club to ride relatively comfortably through more than two decades of nationwide contraction in squash, whilst also enabling it to re-invest to maintain and enhance the quality of its facilities. Also unusual is the way the club has maintained its profile of roughly equal male/female (around 60%/40%) membership, unlike the national profile of squash, which is predominantly male. This atypical membership profile has also heavily influenced the way the club has been run. This may be because racketball members tend to be far more willing volunteers. Racketball was introduced to the club by Malcolm and Liz Bate in the early 80s, shortly after the club’s commitment to a large loan to build two new squash courts. Then the recession hit, which signified the start of the end of the squash boom. Initially, racketball was targeted as a day-time activity for women and it grew almost exponentially, mainly via word-of-mouth recruitment amongst family and friends. As a result, the first decade of racketball was almost exclusively a female day-time activity, a stereotype which took almost another decade to break. By the late 80s and early 90s, the growth of racketball started to create far greater pressure on courts during the day (9am to 3:30pm) than did squash on weekday evenings. At its height, in the early 90s, Stourbridge had six teams playing in the day-time West Midlands racketball league, which had six divisions. Sadly the league folded in the mid-90s due to the demise of many clubs in the area and the return of an increasing number of women to full-time employment. Stourbridge simply ran out of opposition. The additional income from 200-300 day-time racketball membership subscriptions was boosted significantly by extra bar profits from the gallons of tea and coffee drunk throughout the day. 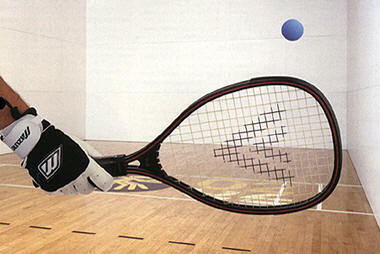 Court occupancy rates are also higher during the day than in the evenings due to the popularity of doubles racketball. “Day-time racketball is as much a social activity as a form of exercise or competition, so it relies upon an all-day bar for drinks and snacks between and after games,” says Club Manager, Judith Hardy. The racketball section also has an active and varied social programme including lunches, walks and other events. Racketball has helped the club to overcome the tennis-squash ‘tribalism’ which exists in many traditional tennis and squash clubs, because tennis members venture inside to play racket-ball in the winter and racketball players play day-time tennis in the summer. “It has helped integration across the three racket sports,” Hardy observes. Moreover, since the mid-90s, more and more squash players have ‘crossed the line’ to take up racketball. The shift was helped by having top level squash players such as Darren Bradbury and Jim Lord contending club racketball finals in the late 90s, which made it a more ‘acceptable’ alternative to squash. These days the club racketball finals attract more spectators than the squash finals. Now the six courts are just as likely to be filled evenings and weekends by racketball as squash players. In many cases they are the same people that were on court ten years ago, just playing a different game of bat and ball. And the club has more racketball leagues than squash leagues – singles and doubles leagues (and juniors) for day-time players as well as for evening/weekend players. Racketball is attractive to a broader market (across age and gender), because it is easier to get started and have rallies as a beginner, and the game provides continued fitness and fun in later years, when the physical demands of squash become too great. What of the future? Racketball is still growing at Stourbridge, especially with the conversion of more squash players and gym members to the game. The club’s challenge is to feed enough young squash players in at the bottom to balance the transfer of ageing squash players. Stourbridge has two teams (one of them female) in the new two-division Midland Racketball League, which hopefully will grow and may even rekindle a day-time inter-club league in future. 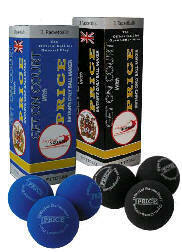 For Stourbridge, racketball has simply made good business sense. It generates significant additional income, improves the balance of its membership, creates more volunteers and strengthens the social base of the Club. Most importantly, it keeps players playing longer and keeps courts in almost constant use throughout the day.